ADP’s main challenges are lead generation and quality appointments. ADP has 15 account managers in Cleveland, Ohio covering a territory from Sandusky to Ashtabula and down to Dover. They are challenged with generating 4-5 new appointments per week per manager. ADP’s prime market is organizations that have a minimum of 50 to as many as 1,000 employees. They were looking to target manufacturing companies. 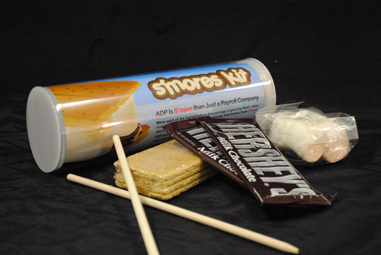 While each of the ingredients in this package is good by itself, when combined together they produce a synergy that makes them S’more appealing to the taste buds. ADP has integrated S’more technology and services to better manage your workforce â€“ from Recruitment to Retirement! Each account manager was then responsible for dropping their kits off to their targeted accounts. Within the first two weeks, a 12% appointment success rate was achieved. This conversation starter gave prospective clients a reason to meet with ADP. The promotion was successful because, as a dimensional promotion, it was different and thus inferring ADP is different than other payroll companies. People were emotionally attached to the experience, additionally proving that when you incorporate more than the visual senses, such as taste and smell, you get even a stronger reaction from the recipient.